Reprinted with permission of the ASA SimTalk magazine, from the Late Fall 2017 issue. The United States is home to diverse climates and geographies. 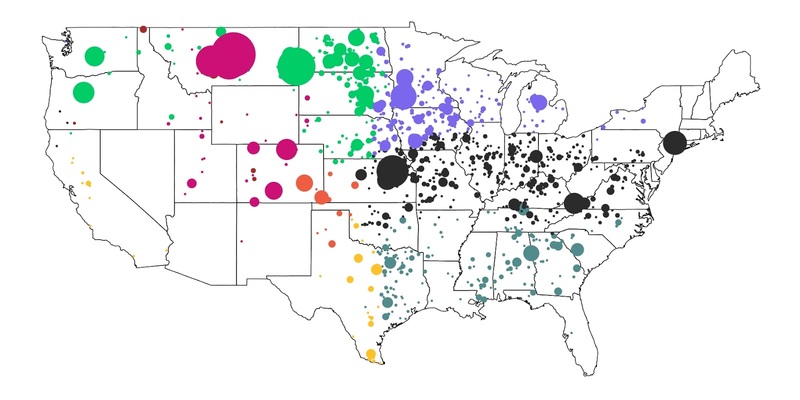 Over the past 150 years, beef cattle have found their way into nearly every one of these unique environments. Some cattle thrive in particular environments, while others struggle. Animals well-suited to an environment performed well and are selected to stay in herds. Poorly-suited animals are culled. As a result, selection occurred on traits that improved cattle performance in different environments. Now, resulting from this selection, there may be a significant amount of region-specific genetic diversity, even within the same breed. In a USDA-funded research project, we are looking to find the DNA variants responsible for this environmental adaption. We will then use these variants to create geographic region-specific genomic predictions. Animals that are poorly adapted to their local environment are less efficient and more expensive to maintain. Most previous local adaptation research has focused on heat tolerance in Bos indicus influenced cattle. Work has only begun on identifying the genetic components of issues like cold tolerance, hair shedding, altitude adaptability, tolerance to pathogens, and other region-specific stressors in Bos taurus cattle populations. The potential economic impact of this research to the beef cattle industry is substantial. A 1993 study predicted that animals poorly adapted to toxic fescue cost the beef industry close to $1 billion per year. Toxic fescue tolerance is only one slice of the local adaptation pie. Other environmental stressors have similar economic impacts. If breeders can tap into genetic potential for tolerance to environmental stressors and animals are optimized for production in their specific geographic regions, the beef industry could save billions of dollars each year. Much like natural selection in wild populations, region-specific selection occurs on existing genetic variation that may be beneficial in one environment, but neutral or unfavorable in another. Over several generations, this beneficial variation becomes more common within a regional population. Put simply, animals that are well-adapted to their regional environments produce successful offspring that remain in the gene pool. Poorly-adapted animals in most cases produce poorly and are culled from their respective herds. These poorly-adapted animals have minimal contributions to future generations. Advancements in genomic tools have made it possible for this diversity to be categorized. We can compare differences between regional populations on the DNA base pair level. Figure 1. Hypothetical example of local adaptation to different regions of the United States. The example in Figure 1 illustrates how region-specific genomic changes are detected. 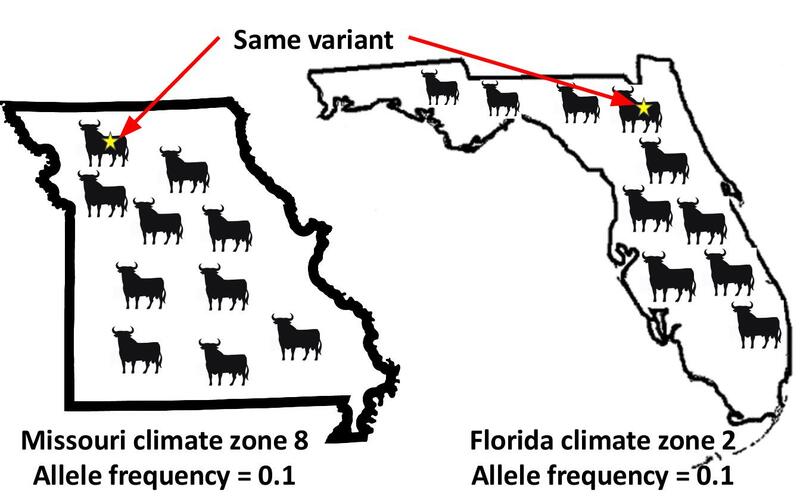 1) A genetic variant (in this example a SNP) is introduced into two regional populations at the same frequency (1 in every 10 animals will have it). 2) In one environment (Missouri), this SNP has a favorable impact on cattle performance. In another (Florida), it has no effect. 3) Over many generations, cattle possessing the favorable SNP in Missouri are preferentially selected. 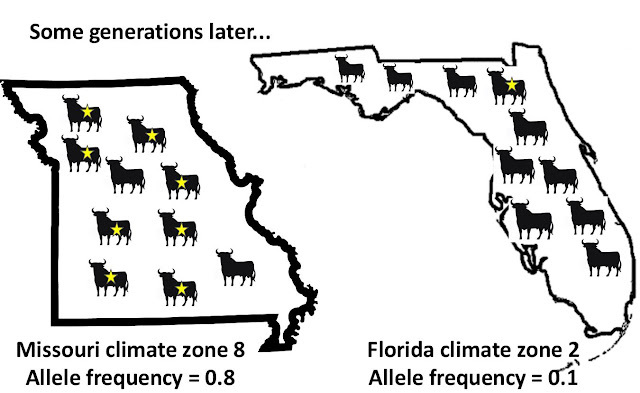 The SNP’s neutral effect in Florida means that no selection occurs on cattle with the variant. 4) Selection over many generations in Missouri drives up the frequency of the SNP in the population, while it stays the same in Florida. 5) Genomic analyses compare hundreds of thousands of markers and their frequencies between populations. Variants showing major differences in frequency between different regional populations are likely under selection. At the University of Missouri, we are using this idea to identify genetic variation within breed populations that could affect how well adapted a cow is to her particular local environment. With the help of the American Simmental Association, and two other major breed associations, we have assembled a geographically diverse set of over 37,000 animals with genotypes. We will use these samples to start exploring region-specific selection. 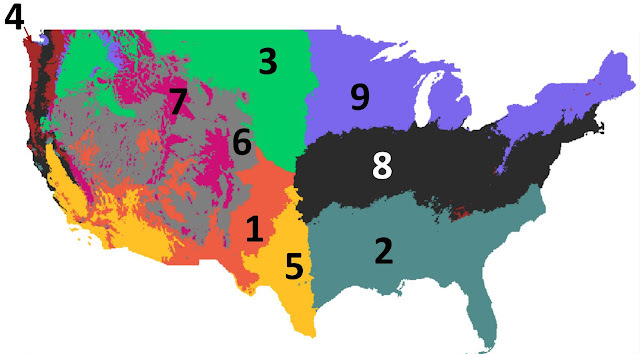 Using 30-year normal values for temperature, precipitation, and elevation, we have divided the United States into 9 distinct “climate zones” (Figure 2). Animals are divided into subpopulations based on their climate zone. Tests for selection will be applied to see if certain genetic variants are being selected in particular regions, but not in others. A geographic distribution of the Simmental animals in the study and their climate zones is shown in Figure 3. Preliminary data analysis has identified a number of DNA variants (SNPs) in Simmental populations that appear to be under selection in specific regions of the U.S. Figure 2. Nine climate regions of the Continental United States developed based on 30-year normal temperature, precipitation, and elevation. Figure 3. Geographic distributions of Simmental animals from the study (9,950 total). Each dot represents a unique zip code. Dot color corresponds with the climate zone in which that zip code resides. Dot size is representative of the number of animals at each zip code. Upon discovering variants that are under region-specific selection, we not only gain an understanding of the biology behind local adaptation, but we can begin using these SNPs to train region-specific genomic predictions. These tools have the potential to re-rank animals based on the region in which they will be used. This will provide producers with the most tailored predictors of how an animal’s offspring might perform in their local environment. Beef cattle are subject to the full brunt of environmental stressors. Controlling a beef cow’s environment on range or pasture is impossible. But, ensuring that our animals are genetically well-equipped for their environment is essential. Troy Rowan is a PhD student at the University of Missouri. Troy attended the Beef Improvement Federation Symposium in Athens, Georgia in June of 2017 with funds from an ASA Walton-Berry Award to the University of Missouri. 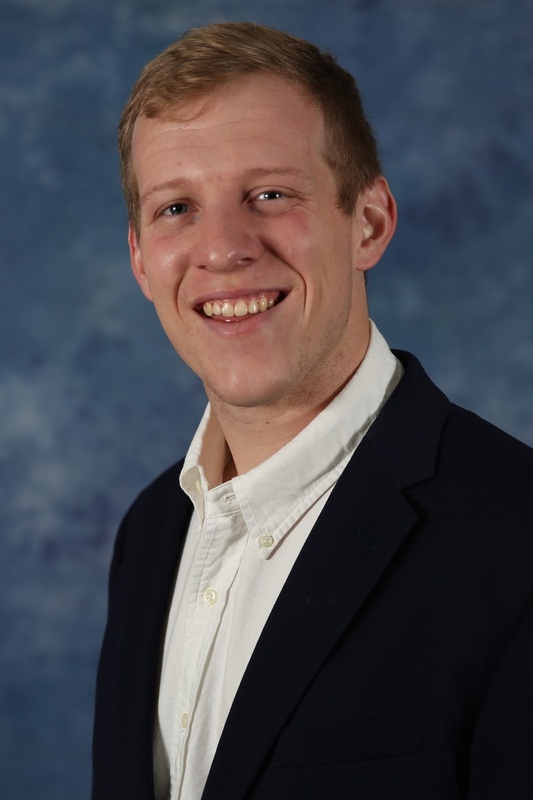 Jared Decker is a researcher and beef genetics extension specialist at the University of Missouri.